Whispers in the Loggia: "Benedict's Mozart"
Austria’s president honored Pope Benedict on the final day of his visit to the “Alp Republic” Sept. 9 with Mozart music in the Vienna Concert House. 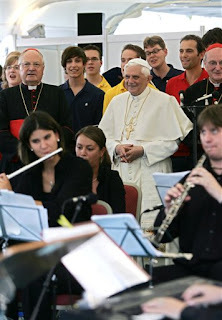 After the music, the Holy Father met with Church and civil volunteers in order to honor their service. Wolfgang Amadeus Mozart was born in the Austrian city of Salzburg in 1756, but that’s not why his music was played for the Pope. In fact, there have hardly been any cultural events that Pope Benedict has attended in which a piece of Mozart has not been performed. That’s because it is well known that Mozart is the Pope’s favorite composer. Music for the Pope is much more than mere entertainment.... “The encounter with the beautiful can become the wound of the arrow that strikes the heart and in this way opens our eyes, so that later, from this experience, we take the criteria for judgment and can correctly evaluate the arguments,” he wrote in August 2002 in a remarkable message, dedicated to the “contemplation of beauty” and directed to a meeting of the Communion and Liberation Movement in Rimini, Italy. In the same text, he recalls an experience he had after listening to a Bach concert conducted in Munich by Leonard Bernstein. For 30 years, Msgr. Georg Ratzinger, the Pope’s brother, was the director of Regensburger Domspatzen (The Cathedral Sparrows of Regensburg), perhaps Germany’s most prestigious boys choir. And even as Pope Benedict, Joseph Ratzinger continues to play the piano in some free moments he may find in the midst of his heavy workload. Tip to Kevin Knight and the great New Advent aggregator. "To the Honor of God"